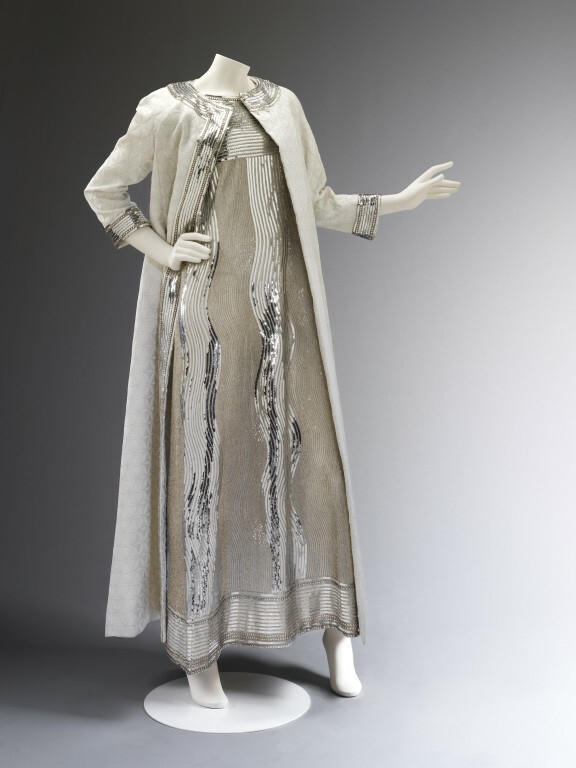 White and silver evening ensemble, consisting of embroidered net dress and matelasse coat. This evening dress and coat was worn by Princess Lee Radziwell to Truman Capote's Black and White Ball on 28 November, 1966. Held at New York's Plaza Hotel, the party celebrated Capote's publication of his non-fiction novel 'In Cold Blood'. Evening dress of embroidered net and matelasse coat, designed by Mila Schön, Milan, 1966. Label for the exhibition: "The Glamour of Italian Fashion 1945-2014"
of American First Lady Jacqueline Kennedy. Married to a Polish prince, Radziwill usually favoured French haute couture, but she chose an Italian dress for this high-profile event. 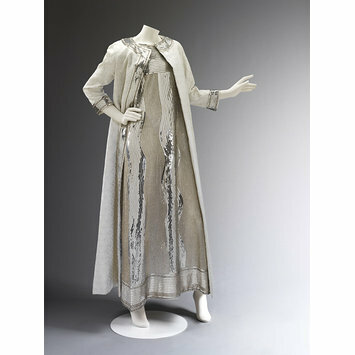 The gown’s sinuous sequinned pattern is set off by the coat’s austere cut.